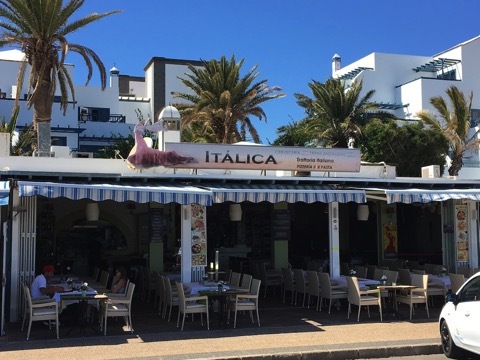 We were looking for somewhere to enjoy Sunday lunch whilst walking along the promenade by Matagorda and Playa Los Pocillos, when the Restaurante Italica caught our eye. We’d noticed this restaurant previously as it’s popular in the evenings, and especially on a Friday night when they have Flamenco entertainment. The name translates as Italian Restaurant so you can expect to find pizza and pasta on their menu, they also offer a great selection of Spanish tapas dishes too as well as International cuisine. I liked the decor of Restaurante Italica, it’s fresh, clean and the furniture is comfortable. We were warmly welcomed by our waiter Jacob who was knowledgeable about our local wines, recommending a semi sweet white from Bodegas Los Bermejos to complement our lunch. We decided to share some tapas, ordering Jamón Serrano and Papas Bravas to start, followed by the Tabla Andaluza for a main course. We had a shaded table, just inside the restaurant and it was a great position to relax and watch the world passing by. You can see the planes coming into land at Arrecife, all kinds of people walking, running & cycling along the promenade and the beach. We were pleasantly surprised at the size of the portion of Jamón Serrano. Priced at €8,75 it was one of the more expensive tapas options, sliced wafer thin and very good quality. The meat was accompanied by wedges of garlic bread and a delicious pot of chopped tomatoes with garlic and herbs. The potato wedges were tasty and quite spicy, just how we like them. The Tabla Andaluza is a massive platter of fish & seafood including puntillas (baby squid), langostinos (prawns) & churros de pescado (chunks of fish in batter). We loved the crispy coating, and 3 different types of seafood, which wasn’t greasy despite being deep fried. We were too stuffed for desserts, but had already decided at this point we would return on a Friday night to try some of their Italian cuisine and enjoy the Flamenco. 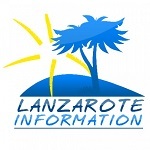 Our lunch bill came to just over €50, of which our Lanzarote wine was €17,50 and the tabla to share was €14. Give Itálica a try next time you’re passing, it’s so much more than just a pizza or tapas restaurant. Villa de Carrida is in Puerto del Carmen's most upmarket and quietest area. It has 3 bedrooms, sleeps 7 and has a private swimming pool.